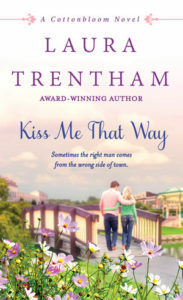 Kiss Me That Way is the newest release from Laura Trentham, an author I have come to find quite delightful. She writes both contemporary romances set in the American South and English Regencies, which are two of my personal favorite brands of romance-nip. This particular book is the story of Cade and Monroe, who built a connection in their childhoods that shaped both their lives. While Monroe stayed in their small hamlet, located at the border of Mississippi and Louisiana, Cade took off as soon as he turned 18 with plans to never return. Of course, those plans are foiled recently before the start of the story and he finds himself back in Cottonbloom. This is one of those books that builds the world slowly and richly before it lets the characters out for a spin. Cottonbloom feels like a living, breathing place with its own foibles, history, and character. The people in this town have known each other for ages and yet still manage to have secrets and mystery about them. Monroe knows that better than most, especially considering that her life is more complicated than most people seem to give it credit for. If I seem like I’m being oblique, I apologize; it’s certainly unintentional. While there are not massive events in here which could spoil anything, Trentham’s is the kind of writing that deserves to be encountered on its own. Let her spin this town and its baggage out before you as you wade into their lives. Don’t just take my word for it. I will say that I particularly appreciate Trentham’s treatment of a storyline involving violence against women, domestic and otherwise, and the complications that come with working in that arena. Monroe’s passion is training young women to survive domestic violence and even escape their own circumstances. She makes some decisions that are easy to judge as mistakes by outsiders, but clearly feel appropriate and authentic to her. The way she wrestles with both reality and hope is so realistic and I’m thankful for that small way the book made its world seem more real. Overall, I would recommend this one for anyone who is a fan of second-chance romances, as well as slow burn books infused with Southern culture and hospitality. Enjoy with a tall glass of sweet tea, and throw some bourbon in it if feeling so inclined. National Coalition Against Domestic Violence: If you’re in the U.S. and are interested in becoming involved in advocacy on any level, I’d encourage you to check out the NCADV. I received a copy of this book both from NetGalley and from Tasty Tours Promotions in exchange for an honest review. I am thankful to both for a chance to read this delightful story. Bourbon, Contemporary, Domestic Violence, Second Chance Romance, Steaming Up Windows, Sweet Tea, U.S.